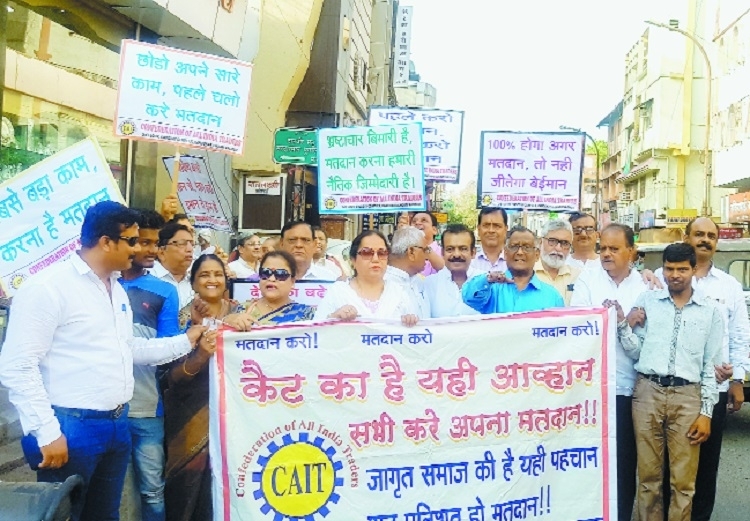 In a nation-wide campaign to spread awareness of importance of voting called by Confederation of All India Traders (CAIT), in Nagpur, Team CAIT Nagpur is taking out rallies in different areas. Market areas are special focus. In Tanga Stand, the rally was welcomed by Itwari Sarafa Bazar Association representatives including Kishore Dharashivkar, Rajkumar Gupta, Manu Soni and Ashwin Rajai. Addressing traders, National President B C Bhartia said, “As per Constitution of India, our country has Government of the people. Hence, all people should participate in the election process. If we do not vote, we have no right to criticize the Government. Many visionary, good people do not contest or they do not get party ticket because the persons whom they represent do not go for voting.” Bhartia said, “If we want persons of our liking to be in Government, we will have to vote enmass. Make Govt of people in true sense.” Concluding the speech, he said that generally voting percentage ranges from 60 per cent to 65 per cent. The difference of margin is 5 per cent to 10 per cent. More percentage of vote can change the arithmetic of elections. In Maskasath, the rally was welcomed by Nilesh Suchak, Kirit Pachmatia, Sanjay Suchak and others. The trade leaders present addressed the gathering. Nilesh Suchak said that CAIT had always worked for general benefit in addition the working for trade and traders. He congratulated B C Bhartia and his team for this novel initiative. Chairman Gopal R Agarwal said that if everyone start voting then caste or religion based candidature may change and persons who are performers will get start getting tickets. President Kishore Dharashivkar appealed to all the traders to come out for voting with families of staff and customers. Sanjivani Choudhary spread the awareness by performing skid at Tanga Stand, Saheed Chowk, Maskasath etc. In the morning, the campaign was carried out at Dr B R Ambedkar Garden and Lakadganj Quetta Colony Garden. Prominently present were Vinod Gupta, Ramkrishna Gupta, Mahesh Dange, Sagar Dabade, Rakesh Gupta, Manoj Lunawat, Vishal Patel, Mahendra Waghmare, Shyam Shukla, Ravindra Gupta, S B Bhutolia, Rajesh Bangre, Sailesh Parekh, Shankar Kakkad, Jagdish Kashyap, Madhu Trivedi, Manoj Kashyap, Chaya Sharma, Jayshree Gupta, Sapna Talreja, Meena Baserk, Anita Totewar, Ramu Nadar and other traders, informs a press release by Farooque Akbani, Secretary.